After some beautiful spring sunshine, this week has seen a return to dark skies and freezing temperatures, typically heralding the onset of the lambing season in the north east. By mid-march most sheep farmers with breeds such as Mules, Suffolk and Texels expect a scattering of early lambs and are gearing up for the onslaught later this month. Youngsters around the region will be looking closely at the new generation of sheep with the hope of finding a champion amongst them for this May’s Northumberland County Show. One young hopeful, Robbie Binks, aged 11, is very excited about this year’s show. Since the tender age of 7 he has been helping local farmers in the North Tyne valley with their lambing. His enthusiasm has led to the foundation of a successful sheep enterprise. It all started when neighbour, Michael Lishman of Fell Lane Farm near Barrasford, thanked him for his outstanding hard work with the gift of a breeding ewe. He now keeps a flock of 12 Beltex and Texel ewes there, whose offspring recently won several awards at Hexham Mart’s Young Farmers’ Fat Lamb Classes. Robbie’s entrepreneurial skills are not limited to sheep rearing; after the lambing sheds are empty he rears Saddleback piglets in them, and also sells eggs from his own hens to locals. The Show is held on Bank Holiday Monday 27th May 2013, and promises to be an excellent day out for all the family. 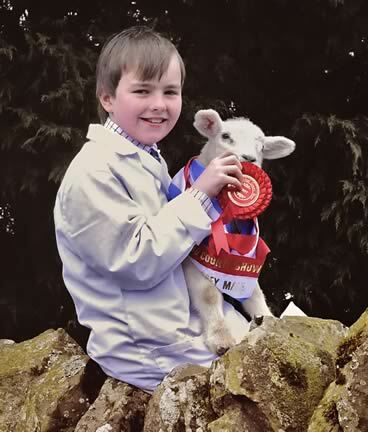 With its focus on young people, this year’s show sees the launch of junior handling classes in both sheep and cattle, and children’s baking and handicraft competitions.